From the Mountain Box of Wax I would reorder: RG Snowflake, RG Soothing Lavender Dreams, RG Pecan Waffle Fluff Puffs, RG Cheltic Moonspice/Ooey Gooey Caramel/Marshmallow Smoothie, FP Christmas Memories these grubbies filled the cabin for two days straight... the most excellent Douglas Fir scent, FP Loopy Cream Cupcakes, Streetman Bonfire on the Beach lovely bonfire scent that mingled well with the Bath and Body Works Winter candles I brought, Streetman Summer Lovin', Streetman Bomb Pop and Fruit Spritzer I melted both of these at the same time in separate warmers but they mingled so well I could not get a handle on which I liked best or distinguishing features. I will reorder and melt individually next time. Overall, strong fruity and bright scent. Not syrupy or cloying. Beezy Marshmallow Sugar Cookie grabbed one more in his latest restock, strong. iheartwax Vanilla Mint Flip Flops very mellow minty vanilla with a touch of coconut. Very calming and nice background scent. 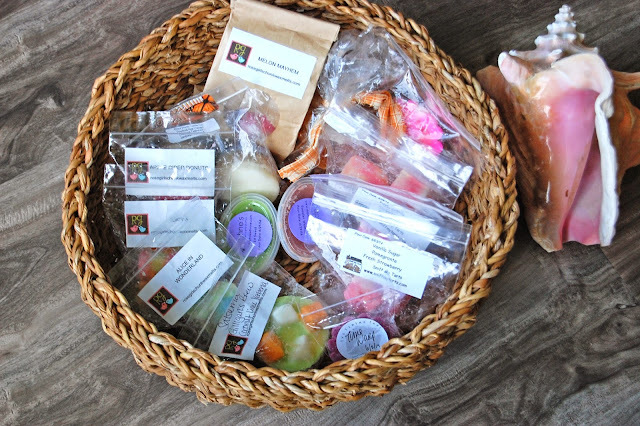 If you have any questions about any of the melts in this or previous baskets, please ask! Summer break is halfway over, only a month left before back-to-school, back to work excitement begins. How is your summer coming along? A few soapies came my way too. I took a slice of Herne to test, and my bathroom smelled like a bag of cinnamon scented pinecones for most of yesterday. Whew....I will be better about sticking to the September rule. Nice!!! Cinnamon pinecones sound yum! Soapy packages are nice aren't they? Welcome Home! Your vacation instagram pics look amazing! I'm so glad you enjoyed BP & FS from Streetman. I'm going to melt the summer lovin' scent shot you gave me this weekend. Thank you Sunnee! I think I will post our vacay pics this morning. I hope you like summer lovin'. If you do decide to gift someone a clean home post-vacation, they will kiss the ground you walk on! Lol!